The capital of Binh Thuan province, Phan Thiet is a small but thriving Vietnamese city and while it would be a decent destination in its own right, it’s been overshadowed by its neighbour Mui Ne. Many only pass through Phan Thiet – there’s no good reason for the foreign tourist to dally here when a prime beach town is beckoning just over the horizon. But to simply know Phan Thiet as the gateway to Mui Ne would be unfair. It has enough local charm and character to satisfy curious travellers for a day or two, if time allows. Phan Thiet is popular with Vietnamese tourists, drawn by cheap, fresh seafood and the large public beach. This would be at odds with the kind of foreign tourist who loves formal dining and a private, quiet, clean beach. From a western backpacker’s perspective, Phan Thiet presents a few challenges. Budget hotels in Phan Thiet aren’t set up for foreign needs or tastes (example, no motorbike rental) and there are no real deals, just a smattering of mediocre, pricey accommodation across from the beach. Overall, Mui Ne yields much better value accommodation. But the main public beach, running along Le Loi Street, has a wonderful energy in the late afternoon as people arrive in droves to enjoy a splash. Kids frolic, boys play football, women build sand castles, men jog and stretch, while grandmas collect cockles in the sand. The main concentration of beach is over a kilometre long, but you can continue to walk up the coast past Ocean Dunes Resort where it is practically empty. In the opposite direction, head to the western end of Le Loi, then south on Vo Thi Sau to the sand. At night, this area is the dark, romantic spot for couples to canoodle. We were told that the beach is cleaned regularly but unfortunately when we were there in March 2016, it clearly had not been done in a while as there were piles of rubbish everywhere, with kids playing amid them. If beach time is your main draw, then head to Mui Ne – it has Phan Thiet beat. One thing where Phan Thiet reigns supreme is the food. Forget the pricey eats of the touristy Mui Ne. The city has amazing local eats and a few joints with Western comforts. For cheap seafood, head to Pham Van Dong Street which is lined with bustling seafood restaurants. If it wasn’t fresh and tasty, the locals wouldn’t go. Aside from good eating, travellers can do a day trip to Ta Cu Mountain, Ke Ga Lighthouse and the wild white sand beach around it as a 90-kilometre triangle loop. Another half day can cover several minor city sights, and no doubt you’ll see dragon fruit farms and smell the many fish sauce or nuoc mam factories along the way. While nowhere near as impressive as My Son in Da Nang, the Po Shanu Cham Towers — which can be visited from here or Mui Ne — provide a quick opportunity to see the remnants of the Champa Empire. The Ho Chi Minh Museum is located on the Ca Ty River at 39 Trung Nhi. This won’t be of interest to most travellers, but if you’re curious about life in modern Vietnam and how Ho Chi Minh is perceived by the people, it isn’t a bad place to start. The teachings of Uncle Ho are still closely studied and his legacy revered. Most of the museum is black and white photos documenting his revolutionary career with a few objects from his life. Admission is free, though they didn’t even bother to turn on the lights for us. Just across the road is Duc Thanh School where Ho Chi Minh (back then just a young humble teacher Nguyen Tat Thanh) taught in 1910, before he left for Saigon to set sail for travels abroad. The school was closed in 1912, but rebuilt in 1980 as an exhibition house in his honour. Museum and school open Tuesday to Sunday 07:30-11:30, 13:30-16:30. The Van Thuy Tu Temple (Whale Museum) at 54 Ngu Ong Street is worth a quick stop to see the enormous 22-metre long fin whale skeleton, very impressive from up close. The sign indicates it is from 1758. For centuries Binh Thuan province denizens have depended on the sea and it was believed that in bad weather and rough seas, whales would guide fishermen to safety. A local practice arose over the years of paying homage to the whale deity of Nam Hai; the temple was built in his honour in 1762. The placard reads that many valuable Chinese and Chinese transcribed Vietnamese cultural relics (including 23 honour merits awarded by the Nguyen Dynasty) and 100 whale skeletons. All we saw was a glass box stacked with dusty whale bones. You can see the small temple on your own, though the eager caretaker will want to guide you through and then ask for a donation to the box; 5,000 dong should do. Admission to see the big whale skeleton is 10,000 dong. Open daily 07:00 to 11:30, 13:30 to 17:00. Stop in at Can Chan Fish Market, the big, smelly fish market on the Ca Ty River. It’s not for the squeamish. At the market you can try picking up a sampan tour of the river, with boats taking up to four people. If you do this on your own, be prepared to speak some Vietnamese or do charades. Finally, take a look at the elegant water tower designed by Prince Souphanouvong – if that name sounds familiar, he became the first president of Laos after the Communist victory, ruling from 1975 to 1986. Built in 1934, it is now a symbol of the city and the province. It is beautifully lit at night. And don’t forget, all of Mui Ne’s sights are a stone’s throw away. If you don’t want to stay in Mui Ne’s tourist strip, Phan Thiet is a decent base to see the sand dunes, Mui Ne harbour and Hon Rom and Suoi Nuoc beach. Except for the sand dunes, the rest is accessible by local bus. Phan Thiet is a relatively small city. Highway QL1A flanks the northern edge of the city, while the Ca Ty River cuts the city in two: The western bank hosts the older part of town, and the eastern bank has more recent development, the beach and most of the accommodation. Several bridges connect both sides. The main beach runs along Le Loi. To the east, Nguyen Thong Street leads to the Mui Ne tourist strip and desert highway TL706B. From Phan Thiet train station, it’s 13 kilometres to the start of Mui Ne’s tourist strip. For groceries and other self-catering supplies, there’s Co-op Mart in the heart of downtown and Lotte Mart in a newer development in the northeast corner of town. In terms of traffic, Lotte is far easier to get to. It is well-stocked and also has a cinema. 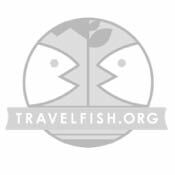 Please sign up as a Travelfish member to download the Phan Thiet guide PDF (1.6 MB, 23 pages). Membership costs just A$35 per year (less than A$1 per week) and gives you access to over 250 PDF guides. Browse our independent reviews of places to stay in and around Phan Thiet. Read up on where to eat on Phan Thiet. Check out our listings of things to do in and around Phan Thiet. 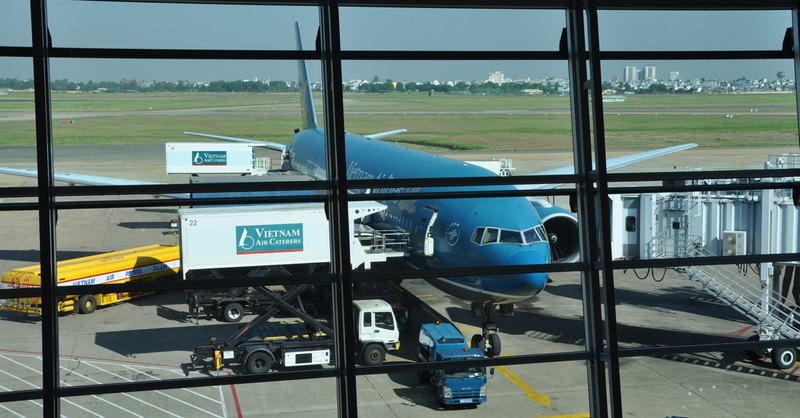 Read up on how to get to Phan Thiet, or book your transport online with Baolau. Planning on riding a scooter in Phan Thiet? Please read this.  Use the above map to find specific destinations in and around Phan Thiet which are listed on Travelfish. Bed icons indicate a guesthouse, hostel or hotel, the knife and fork is an eatery or bar and the four-way circular thingy marks sights, attractions and other points of interest. Click on any icon for a short pop-up and a direct link to the page for that spot. If you are in the area, use the teardrop icon near the top left to show your position on the map (you'll need to allow position sharing for this last feature to work).